Spicy Veggie Quinoa Curry | Dizzy Busy and Hungry! 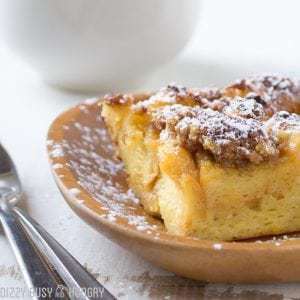 Just a note: This recipe originally appeared as a guest post on Memories by the Mile. I have now posted the recipe here as well for archiving purposes. The recipe is below my original teaser post. 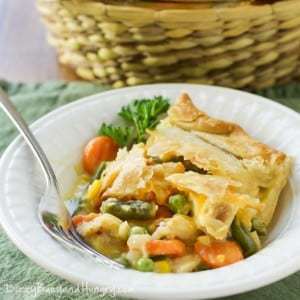 Check out Wanda Ann’s site too, she has a ton of great recipes! Enjoy! 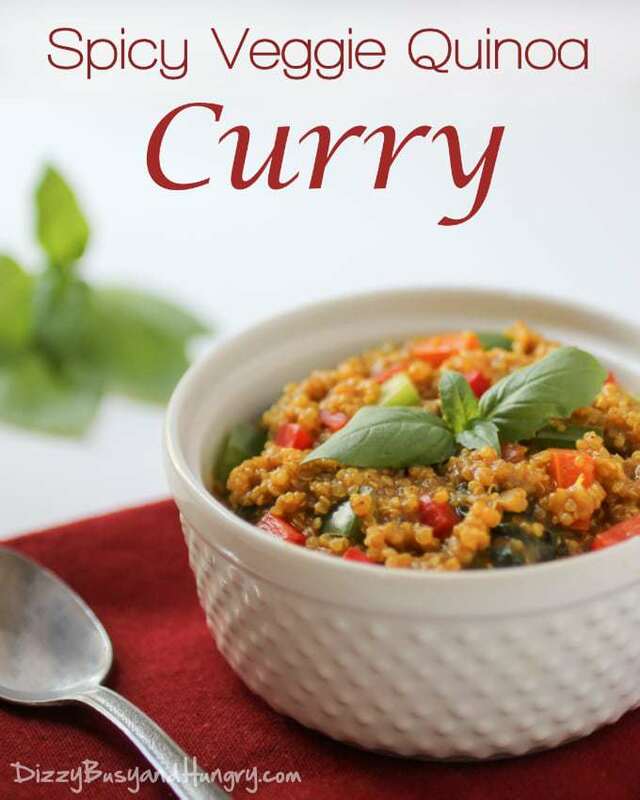 Speaking of hot, today I am sharing with you a recipe for Spicy Veggie Quinoa Curry. It is not super-hot, like an August afternoon in southern New Jersey, but it does have a nice little kick to it! Of course, you can dial the spiciness up or down depending on your family’s preferences. I try to keep it fairly mild for my family, especially for my younger son who seems to be allergic to flavor. Hopefully someday he will outgrow that, but in the meantime I try to not go too crazy with the spices! Quinoa, of course, is really good for you. If you have not tried it yet, you really should! 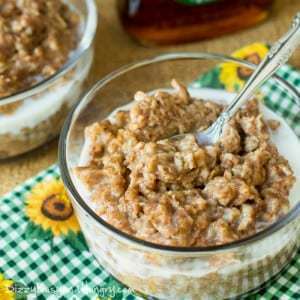 You can use it like you would use rice, but lots of people also use it in breakfast dishes, like you would oatmeal. 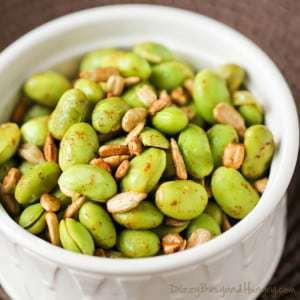 It has a slight nutty taste, but the flavor is very mild and so it will take on the flavor of whatever you cook it in. 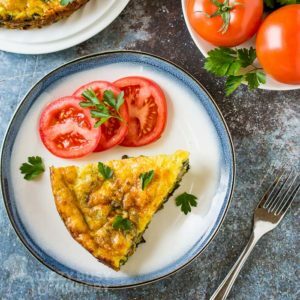 This recipe is actually vegan, and while not all vegan recipes are good for you, this one really is! 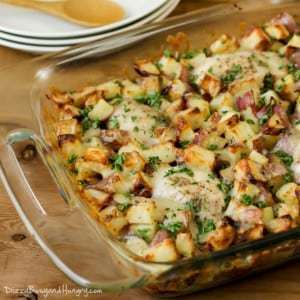 You can use this recipe as is and make it a side dish for 4 people or an entree for 2. Or you can double the recipe and serve it as an entree for 4 people. 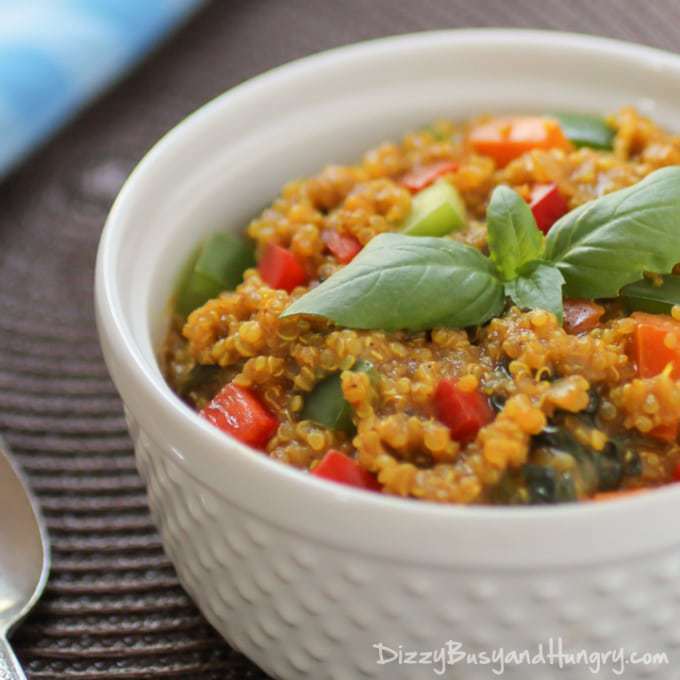 Quick, easy, and healthy quinoa and veggie dish with lots and lots of flavor! Mix together the quinoa, coconut milk, vegetable broth, curry paste, brown sugar, and Sriracha sauce in a pot over medium high heat. Bring to a boil, then reduce heat to low and cover. Simmer about 15 - 20 minutes until all liquid is absorbed and quinoa is tender but not mushy. Heat the vegetable oil over medium heat, then add the garlic, pepper, onion, and broccoli/cauliflower. Saute until vegetable begin to soften. When the veggies are almost done, add the spinach and stir until wilted. Combine the quinoa with the veggies and serve. Click here to head on over to Memories by the Mile get the full post, and while you are there, check out some of the other awesome posts on Wanda Ann’s blog! Sounds very yummy, and I know how good it is for you! Thanks for sharing with SYC. I need to try this. Thanks for joining the To Grandma’s House We Go link party! Hope to see you next week. I’m not big on spice normally, but I might have to try this anyway, it looks delicious! Thanks for sharing at Merry Monday. Pinned! I’m not a huge fan of quinoa but I have to say, this looks pretty good. I think I would eat this! Thanks for sharing at the What’s for Dinner party! Love this recipe, and the photos are stunning! 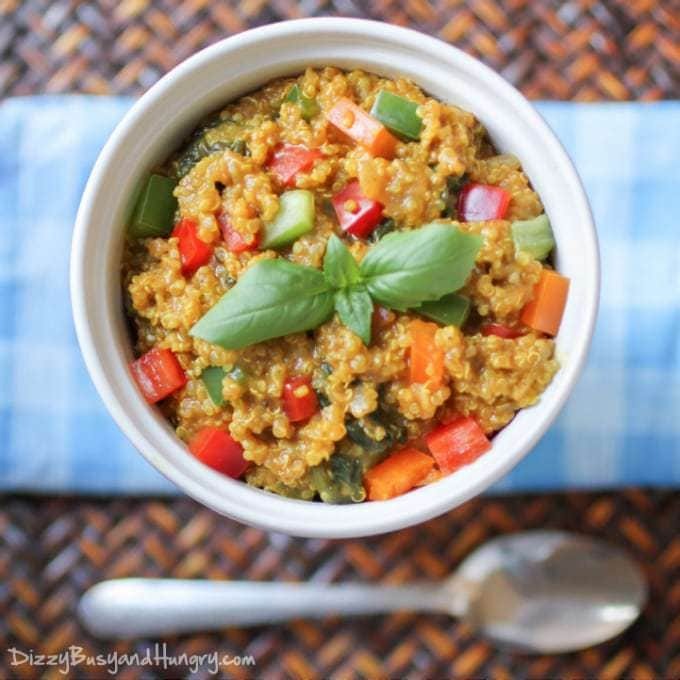 Thank you for sharing another great use of quinoa! Irrespective of the fact that I am your mother and in my eyes you can do NOTHING wrong,, this is a truly fabulous dish. I disagree that it’s a sidedish though With the quinoa and all those veggies, it is definitely a main dish and unbelievably yummy. I tripled the sriracha sauce (and I use the really hot stuff) because I think coconut milk cuts some of the heat and you know that we like really spicy food. Anyway, I am SO glad that I didn’t put you up for adoption during those first six colicky months of your life! And the leftovers are even better! Sounds and looks good, we just recently began eating Quinoa so this is perfect to try. Heading over to see the full recipe and pinning, thanks! I haven’t made a spicy quinoa dish yet! Yours is plum gorgeous!!! We adore quinoa in this house and use it regularly as a rice substitute, but I never think to add it to anything. This looks delicious indeed. Quinoa is so good for you! This looks tasty and I think I’ll make next week for my lunches! I’ve made quinoa a few times and feel like it is so bland you HAVE you have to add something spicy. I’ve give your recipe whirl! I have to keep my curry dishes mild, but it’s for me not anyone else in the family! Wonderful dish! !